Refols ransomware is a dangerous malware infection which is a variant of Djvu. The hazardous infection spread through email messages and appears on the computer system unnoticed. First of all, it starts compromising Windows Registry keys by adding its own. After that, files get encrypted and end up with the .refols appendix. When data becomes, useless victims receive a ransom note which is named _readme.txt. Crooks claim that the only way to reverse files back to their previous states is by purchasing the decryption tool from the cybercriminals themselves. As evidence, they offer to send one file via merosa@india.com, and merosa@firemail.cc email addresses for test decryption. However, neither this nor the discount on the ransom amount can guarantee the file recovery. 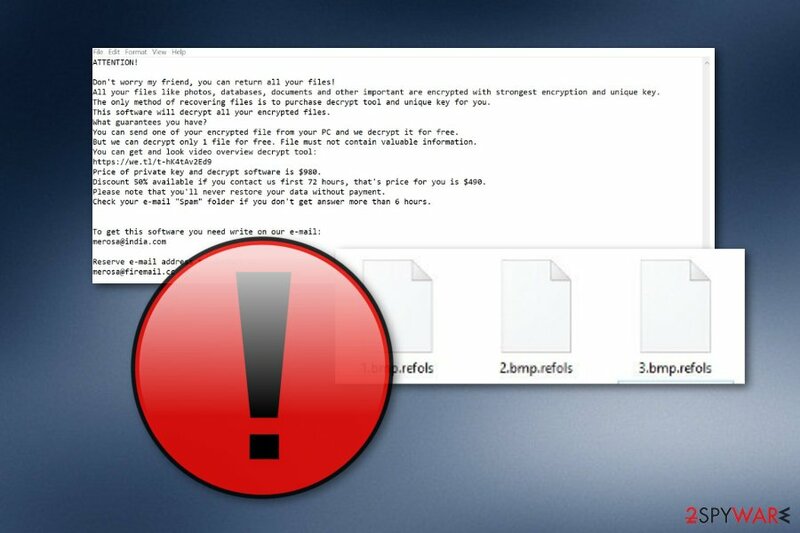 Refols ransomware is the virus that hails from a notorious virus family named STOP virus. This particular family of Djvu ransomware has a bunch of different versions. In Spring 2019 this virus was especially active, and since the beginning of March, more than 20 new versions got released. 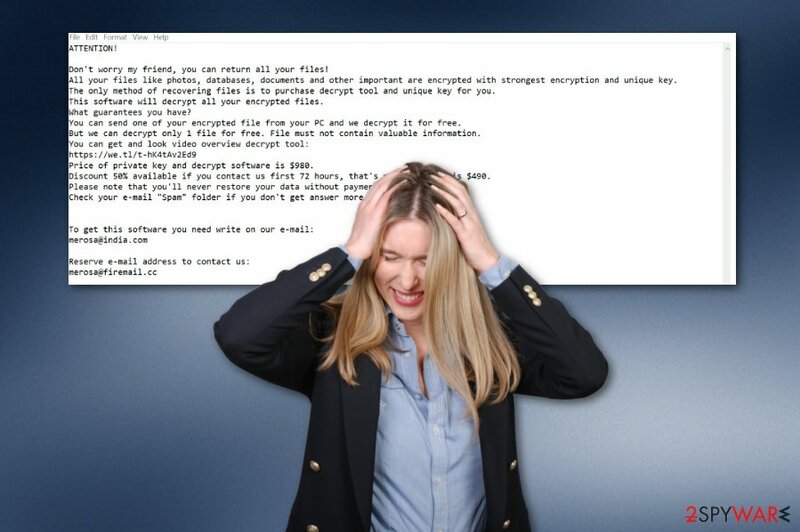 The encryption process that Refols ransomware virus starts after the initial infiltration begins with changing the original code of various personal files like photos, documents, videos or archives. Then .refols file marker gets added to every affected file and ransom note appears in every folder with encrypted data. However, Refols ransomware affects other files on the system too, including system files, registry entries, and startup preferences. Virus developers added these functions to the malicious code so that threat can be more persistent and active on the infected system. Refols ransomware adds new files to run additional processes and disables some security functions or even antivirus programs, so virus termination becomes difficult and requires other steps like rebooting the machine in Safe Mode with Networking. All those helpful tips can be found in the step-by-step removal guide below the article. However, for the best Refols ransomware removal, we recommend using anti-malware programs, as any other cybersecurity expert would. Tools like this can provide a thorough system check and eliminate threats or even fix some issues with the machine. Remove Refols ransomware and clean the system, eliminate virus damage with Reimage or another anti-malware tool of your choice. Since ransomware makes other changes on the system, you need to scan the device entirely to fix all of them and be sure the PC is malware-free for the data recovery process later on. The one technique that is widely used by malicious actors is email spam campaigns. The method involves hiding the malicious purpose on the commonly used file like a document, PDF or even executable. To conceal the presence of the payload dropper virus developers set the email to pose as a notification from legitimate service or company. When the email gets opened, it presents a hyperlink directly in the text or file attachment with “financial information”. Visiting the provided site can start the automatic download of a malicious program or payload dropper and documents often encourage users to enable the additional content and once that is done malicious macros get triggered. You need to avoid downloading files from such emails and opening the notifications altogether. Clean the email box more often and make sure to pay close attention to emails you get every day. Employ good AV tool to keep the system clean. Refols ransomware virus is a version of the well-known ransomware that creates new variants regularly. Based on the previous infections this is not a very altered version, so detection rate should remain similar to others. However, remember that antivirus tools have different databases, so you should try a few when one of them don't detect any malware. We offer using Reimage, Malwarebytes MalwarebytesCombo Cleaner, or Plumbytes Anti-MalwareMalwarebytes Malwarebytes for Refols ransomware removal. Make sure to choose the reputable provider or get the program from the official website or our website to ensure the safe installation. Remove Refols ransomware and clean the damage with the antivirus program and then you can try data recovery method of your choosing. We recommend replacing affected files with safe ones from the backup, but there are a few data recovery software suggestions below if you need alternatives. Log in to your infected account and start the browser. Download Reimage or other legitimate anti-spyware program. Update it before a full system scan and remove malicious files that belong to your ransomware and complete Refols removal. Use these instructing lines to turn on the System Restore feature on your machine system. This feature might be helpful and let you deactivate the ransomware. When a new window shows up, click Next and select your restore point that is prior the infiltration of Refols. After doing that, click Next. Once you restore your system to a previous date, download and scan your computer with Reimage and make sure that Refols removal is performed successfully. Guide which is presented above is supposed to help you remove Refols from your computer. To recover your encrypted files, we recommend using a detailed guide prepared by 2-spyware.com security experts. Spotting files with a dubious appendix such as .refols is not a good sign at all. That means an infection called Refols ransomware has managed somehow to enter your computer system and encrypt all of your valuable data blanks. Try the below-given techniques if you are keen on recovering your files. Data Recovery Pro is a tool for file restoring. Using this tool might allow you to recover some of the .refols files. If you had enabled the System Restore before the cyber attack took place all over your computer, you might be capable of restoring encrypted files with this tool. If the ransomware virus did not eliminate Shadow Copies of your files, we recommend giving this method a try. Sadly, no original Refols decryptor has been discovered. ^ Kacy Zurkus. Why you shouldn't pay the ransomware fee. CSOonline. Security news, features and analysis. ^ Encryption. Wikipedia. The free encyclopedia. This entry was posted on 2019-04-09 at 04:24 and is filed under Ransomware, Viruses. You can quickly scan the QR code with your mobile device and have Refols ransomware manual removal instructions right in your pocket. How did you remove Refols virus?